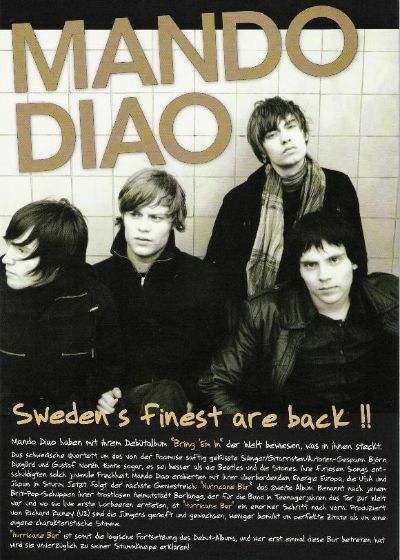 Mando Diao is a swedish Rockband and was built in 1999. 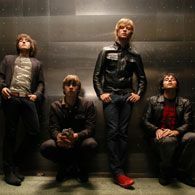 They consist of Björn Dixgârd, Gustaf Norén, Carl-Johan Fogelklou, Samuel Giers and Mats Björke. Their first band built the leadsinger Björn in the middle of the 1990´s together with Daniel Haglund and two other mates. All of them came from Borlänge in Sweden. In this time they existed in this cast. 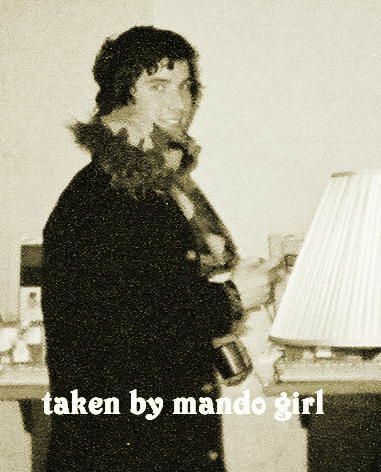 Then, shortly after this, the two other mates left the band, because of their study. At one night Björn met Gustaf at a party and they decided to admit Gustaf to the band, because they liked each other from the first moment on. After several time CJ and Samuel joined the band. Later Daniel left the band and then Mats Björke joined the band. In the years after the foundation toured through many bars and clubs in whole Sweden. On this way they assembled a little fanbase. 2001 EMI became the management of the band. “Bring ´em in”, the debut album, were released in september 2002 only in Sweden. This album was very succsessful. The band got many positive criticism. Their first single “Motown blood” was succesful as well. Catchy riffs and melodies in the style of the 60ies and 70ies, and the unique voices of the both singers elated many people. Some people, who have no idea, blamed the band “arrognace” and “self-conceit”. They had no idea (this is my individual opinion!). 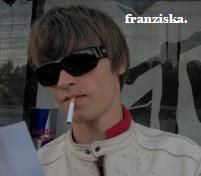 After the commercial break, Mando Diao toured with local rockbands (The Hellacopters, Kent). 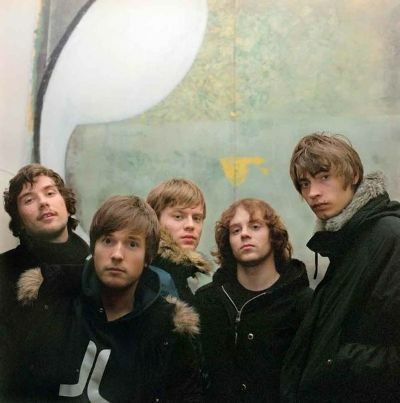 2003 they became international famous. At the beginning of the success they were a big hidden-tip ...yet. Through the year 2004 they became famous in Germany, by German fans. 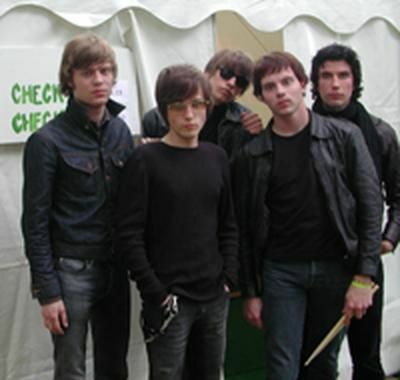 Their second album “Hurricane Bar”, arrived in january 2005 the top-30 of the albums-charts in Germany. 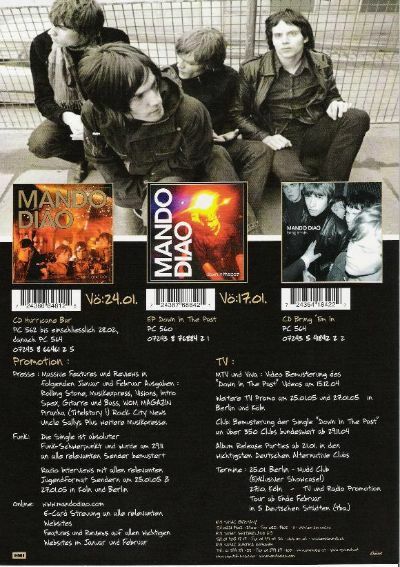 After this succsess Mando Diao went on a Germany tour and played on many large festivals (Hurricane, Rock am Ring, Rock im Park, MTV Campus Invasion Regensburg). Now the next big tour is added and many concerts are sold out or were confounded to bigger halls. 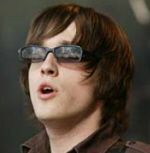 At the Campus Invasion Regensburg 2005. Comment: When we have to remove pictures, please write us an e-mail.